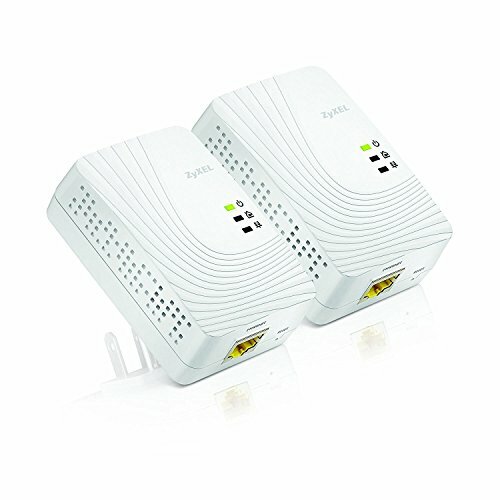 The ZyXEL PLA5205 600 Mbps Powerline Gigabit Ethernet Adapter Kit provides the simplest and most effective way to expand your home network. Just plug in a couple of PLA5205 and improve your network performance by more than 20% compared to 500Mbps powerline technology, instantly providing more stable multiple-HD media streaming, multiplayer gaming, and other network applications simultaneously throughout your entire home. 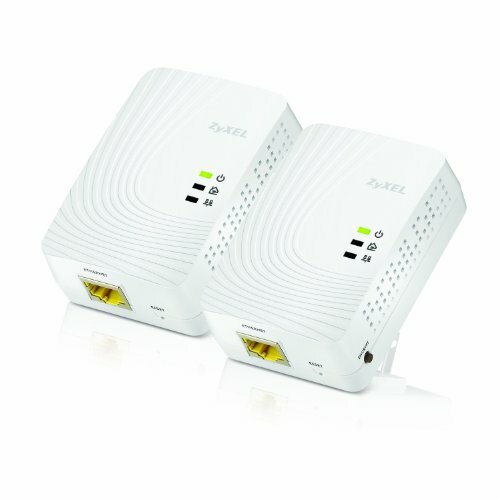 The compact size and versatility of the ZyXEL PLA5205 allow you to transform your home electric lines into wireless networks by simply plugging them in, all without having to block any of your existing power outlets. Data transmission of the PLA5205 is protected by its 128-bit Advanced Encryption Security mechanism that can be configured with the press of a button and without the need for any complicated setup or additional software. Through its utilization of the latest HomePlug AV2 technology*, the ZyXEL PLA5205 Kit provides speeds of up to 600 Mbps as well as backward compatibility with HomePlug AV and IEEE 1901-based products. Also, the Gigabit Ethernet capabilities of the PLA5205 ensure that it will provide a stable, high-performance network for simultaneous HD streaming, gaming and web browsing in every room of your home. The advanced Quality of Service (QOS) feature of the ZyXEL PLA5205 enhances the quality of multimedia streaming applications through its superior traffic prioritization capabilities. 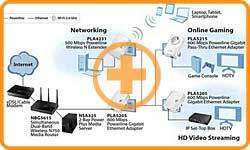 Whether you are enjoying HD video streaming, VoIP, or just high speed Internet access, the PLA5205 enhances the capabilities of all triple play services. When there is no active Ethernet link, the ZyXEL PLA5205 automatically enters its power-saving mode, consuming only 0.5 watts of power. This green feature reduces energy consumption by more than 80% compared to adapters without this function and lets you not only help save the environment, but also save money on your electric bill. * The theoretical maximum channel data transfer rate is derived from HomePlug AV2 specifications. Actual data transfer rate may vary between network environments with different distance, network traffic, and noise on electrical wires, quality of electrical installation and other adverse conditions. ** The SmartLink Plus feature is limited by the ground pin environments with different connectivity, distance, quality of electrical installation and other adverse conditions. Since the CE ground pin usage definition has yet to be clarified, SmartLink Plus is not currently supported on the EU and UK models.